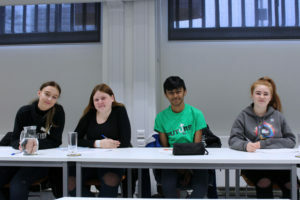 The Future Youth Zone Young People’s Development Group meets Monthly, if you are interested in becoming involved please contact marcel.andrew@futureyouthzone.org. It has been an incredibly busy two years for the Development Group as it has been involved with branding, naming the Youth Zone and putting them out for a vote to the young people of Barking & Dagenham and in total over 2000 young people borough wide decided to name the Youth Zone Future. The Development Group has also had the opportunity to sit with the architects to help design the interior layout as well as sitting on a panel to interview potential staff members. With less than a year to go before opening, the Development Group has participated in key events to commemorate the development of the Youth Zone such as the ground-breaking event in January 2018 which celebrated the start of construction on the site and the start to the Future. 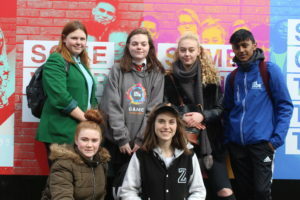 As well as the name of the Youth Zone, the group worked alongside Zak Agency to design the hoardings which will surround the site of the Youth Zone. The hoardings unveiling gave me the opportunity to show my hard work and dedication to Future Youth Zone. The group has been given the opportunity to visit the wider network of OnSide Youth Zones and participating in events such as the annual OnSide President’s Cup which brings together all the Youth Zones and young people get to integrate with other members from across the country. The excitement is growing as we look forward to opening the doors to the Future. BE PART OF SOMETHING AMAZING. BE A PART OF FUTURE.